So, what if summer is still far ahead, there is nothing like being prepared for when it arrives. To get started, we have put up an article that covers some of the hottest upcoming fashion trends that you will witness midsummer. Printed dresses are in vogue. You may blame springtime for this trend as it yields a plethora of patterns in nature’s delectable forms, which we are so in love with that we put them on to our apparels and accessories. Come summer, pep up your style quotient with bold prints. Yes, bold prints are the in thing. Live your fetish for prints, get yourself a top, shirt or dress in bold floral, tribal or abstract prints accompanied with bright and strong colors. No other color spells a pure, serene, and classy look as well as white. 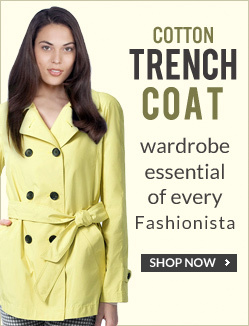 Apparently, it is a color for all occasions and ideal for sunny weather. Boost your holiday wardrobe and create an appealing aura by investing in a summer dress. Go quintessential; carry an elegant and fresh look, for which we recommend you pull on white in form of a mini sundress, a flared frock, strapped dress, cocktail or a lace dress. Besides natural fabrics, shiny fabrics will be the next it item this season. Yes, you are looking to a feminine, soft and fluid fashion season ahead. Materials like satin, chiffon, silks and taffeta will be the prime features of elegant eveningwear in bright and solid hues, offering its wearers a chic and suave feel. For a flowy feminine look, we suggest dresses in chiffon, whereas silk, a perfect envoy of sensuality is expendable as a versatile fabric, making it suitable for the hot summers. A must-have for the fashionista this sunny season is the versatile slip dress. Perhaps, it’s among the most exclusive dresses available that can also be layered under a leather or denim jacket, or simply be worn plain to don different styles. Adorable during daytime and elegant as an evening wear, stock one in your wardrobe to wear your mood. At the beach or a cocktail party, the slip dress makes a definitive outfit to make a style statement.